Great roads. Great riders. Great roads. Great scenery. Great roads. Great company. Great roads. Great hospitality. Great roads. Great accommodations. Great roads. Great Stories. Great roads and great fun and Turbos. This is what you missed if you did not attend the Turbo meet held June 5-7, 1992 in Penn Laird, Virginia earlier this month. Hosted by the editor of the Turbo newsletter and directory (Allen Laird) and his lovely wife, the meet could not have been more enjoyable. Attended by six Turbos, one non-Turbo and one chase truck the group represented seven states ( DE, MA, MD, MI, OH, PA and VA) and one Canadian province (Quebec). The weekend was incident free except for the huge rain front encountered by all riders enroute to Penn Laird that seemed only to whet the appetites of everyone for the ride ahead. 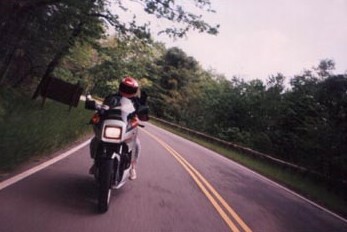 The ride began after breakfast on Saturday morning, over which was heard, "What the ____ are grits and country ham?" The morning had dawned with a mountainous haze that burned off quickly to reveal blue sun-filled skies. For the next eight hours the group alternately cruised and attacked the Blue Ridge Mountains of Virginia. 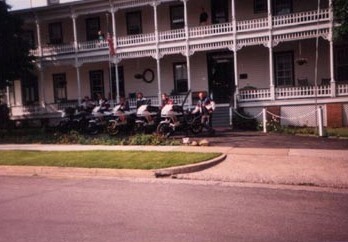 The first 125 miles was followed by a leisurely lunch at Goshen Pass where we were told, "The bathrooms were out back. ", but not told if they had running water or not (they did). After lunch we enjoyed another 125 miles of non-stop mountain switchbacks, roadside waterfalls and deserted roads. When asked the location of any law enforcement officers our host told us, "The moonshiners ran them out of here a long time ago and they have never come back." We half believed him (you were kidding weren't you Allen?) and proceeded onto our group photo opportunity at the resort town of Monterey. The folks at the elegantly restored Monterey Inn were kind enough to allow us to stage our group photo in their driveway. None of us needed any prodding to produce smiles because all day under our helmets we had ear to ear grins plastered to our faces. The day ended with the group gathering at Allen's house, ordering several pizzas and Talking Turbo well into the wee hours of the night. The next day had us following more relaxed roads at a more relaxed pace. No one seemed to mind as the group drifted leisurely in packs of three or four riders according to which pack fit your riding style at the time. As goodbyes were said and the realities of work and personal commitments crept into the minds of the riders, I knew this was one weekend I would be telling others about for many years to come. The riding, the friends made, the anticipation of future meets was more that enough to make me think to myself, "It really doesn't get much better than this."